[PDF] Multivariate Statistical Methods: A First Course | Free eBooks Download - EBOOKEE! Posted on 2017-12-04, by luongquocchinh. Description: Multivariate statistics refer to an assortment of statistical methods that have been developed to handle situations in which multiple variables or measures are involved. Any analysis of more than two variables or measures can loosely be considered a multivariate statistical analysis. 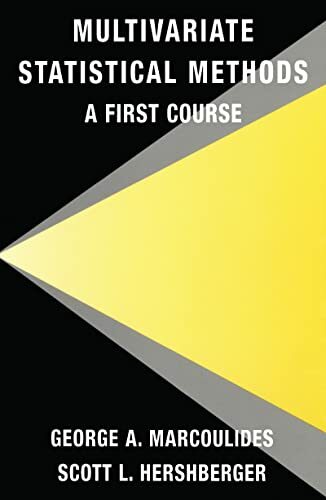 An introductory text for students learning multivariate statistical methods for the first time, this book keeps mathematical details to a minimum while conveying the basic principles. One of the principal strategies used throughout the book in addition to the presentation of actual data analyses is pointing out the analogy between a common univariate statistical technique and the corresponding multivariate method. Many computer examples drawing on SAS software are used as demonstrations. Throughout the book, the computer is used as an adjunct to the presentation of a multivariate statistical method in an empirically oriented approach. Basically, the model adopted in this book is to first present the theory of a multivariate statistical method along with the basic mathematical computations necessary for the analysis of data. Subsequently, a real world problem is discussed and an example data set is provided for analysis. Throughout the presentation and discussion of a method, many references are made to the computer, output are explained, and exercises and examples with real data are included. No comments for "[PDF] Multivariate Statistical Methods: A First Course".